Benzac AC Gel (Benzoyl Peroxide) is a topical treatment that is widely used to treat acne that ranges from mild to moderate in nature. This product has an antibacterial effect, and can effectively destroy the acne causing bacteria present on the skin. Benzac AC Gel (Benzoyl Peroxide) is a topical treatment that is widely used to treat acne that ranges from mild to moderate in nature. This product has an antibacterial effect, and can effectively destroy the acne causing bacteria present on the skin. In addition to this, it also causes the top layer of skin to shed and peel, which helps to breakdown whiteheads and blackheads while at the same time unblocking the sebaceous glands. 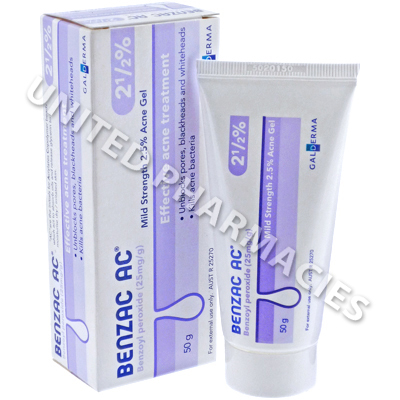 Benzac AC Gel (Benzoyl Peroxide) must be used strictly in accordance with the instructions given by your doctor. A thin layer of the gel is applied to the area of skin requiring treatment as prescribed. Doctors generally tell patients to apply it 1 to 2 times per day. Several weeks of treatment may be necessary before an improvement in symptoms occurs. Continue using it for the entire period of time prescribed by your doctor. Stop using this product and see your doctor straight away if you experience severe burning, stinging or pain, or if you any other signs of side effects occur. You should avoid the use of harsh soaps and other similar products while treating your skin with this topical gel. Also, use of other medicated skincare treatments should be avoided unless approved by your doctor. Do not allow any of this gel to come into contact with the eyes, mouth or any other sensitive body parts. Avoid applying it to damaged or wounded skin. If accidental ingestion occurs, seek emergency medical attention.